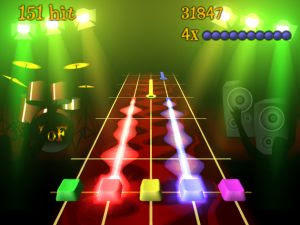 Frets on Fire is a freeware game of musical skill and fast fingers. The aim of the game is to play guitar with the keyboard as accurately as possible. Frets on Fire features unique inverted keyboard gameplay style, support for guitar controllers and generic joysticks, hundreds of songs composed by the community, and more.